Of these three, the first two appear most frequently. 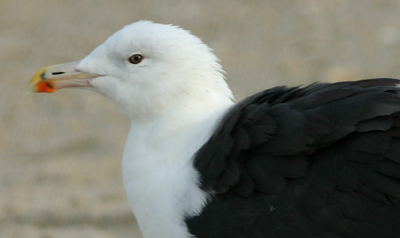 The Great Black-back, however, can sometimes outnumber them in coastal settings. Laughing Gulls are also fairly common in the Northeast, but only in the warmer months. What are your usual gulls? Around here, silver gulls outnumber the others by a huge margin. Pacific gulls are the second most abundant. You have always been my favorite gull. I’m with you, Mike. Gulls are hard. I don’t know how common the Great Black-backed Gull is around me, but I’d never knowingly seen one until it was pointed out to me by my partner for the Presqu’ile CBC–sounded exotic to me! Herring and Ring-billed we have plenty. Your three plus Laughing down here in DC as well. I enjoy new ones on the rare occasion that they show up (like the Bonapartes gull in southern Ohio many years ago in winter), but I don’t seek them out either. Now, terns, OTOH…. Coming from the midwest where there were none nearby, it’s a joy to see them here in California. I suppose over time that may change though. Gulls are tough. Like you, I haven’t developed a taste for sitting there and scanning through a million gulls to find the odd one. I’ll do it periodically, but it’s not at the top of my list. Last year, I bought the two gull videos featuring Jon Dunn that ABA sells. They are educational to a point, but sitting through them is like getting your teeth drilled. Boring with a capital B.
We’re lucky on the upper Texas coast to have a variety of gulls. The interesting thing is that here, you never know what might show up. Like you, I don’t have the patience to look through large flocks for that rarity, but when one shows up, it’s pretty exciting. We have the same three in DC, plus Laughing in summer and a few Lesser Black-backed in winter. Bill, you folks on the upper Texas coast are spoiled for birds. There’s no way around it. Enchilada, I’m with you. I always stop for terns. Robert, the West Coast has some fantastic gulls. Heermann’s is nothing short of spectacular. 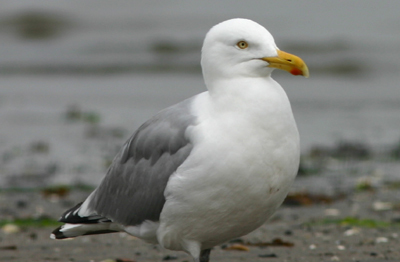 I’m also partial to Larus californicus with its red and black bill markings. As the song laments, I wish they all could be California Gulls. Ah gulls, I DO enjoy them, and admire them, and their challenges. Strangely enough there is something satisfying about picking out the gull with the different coloured eye out of the many. Our usual suspects? 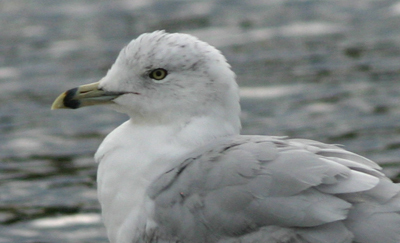 Glaucous Gulls are the most numerous, and then Thayer’s Gulls after that. Iceland gulls do live here, and it is most challenging trying to find them amongst the Glacous. And of course there are the out of town gulls, Ivory, Black-legged Kittiwakes, and Sabines (my nemesis bird). Ross’s is a possibility but not very likely. I’m fairly sure, but not a hundred percent positive that I saw a Greater Black Backed Gull out on the land one spring. On the contrary, Clare, I like fall warblers quite a bit. I’m just not one of those contrarians who prefers them over the spring birds!